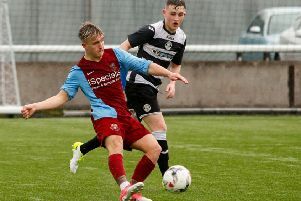 Leith United defeated Lothian East rivals Musselburgh Windsor 3-0 to book their spot in the quarter-finals of the Centenary Cup. They made easy work of Windsor in their own backyard in what was new boss Steven Brown’s first match in charge after taking over in late December. After a goalless first half the visitors grabbed the opening goal on the hour with Cal Paterson heading home from a Chris Inglis corner-kick. Kameil MacDonald did all the ground work in the lead-up to Leith’s second, advancing down the wing before and cutting the ball back to Inglis on the edge of the area who stroked it home. The visitors secured their passage to the last eight five minutes from the end with Inglis again scoring after being played through by Jamie Osbourne. Danderhall Miners eased through to the fourth round of the Logan Cup after a comprehensive 4-0 win at Musselburgh Amateurs. Richard Todd headed in the opener for Danderhall on the half hour from Grant McMillan’s pinpoint cross. The visitors doubled their lead just two minutes later with McMillan this time teeing up Darren Anderson. Danderhall suffered a blow when Blair McDonald saw red just five minutes after the interval, but goals from McMillan and Anderson secure the win. Barca Milton 97 edged a Centenary Cup second-round thriller as they prevailed 4-3 at home to Clermiston Vale. Charlie Adams, Barca’s leading goalscorer saw his first-half penalty saved but quickly made up for that as he volleyed in Michael Gibb’s cross for the opener. Craig Edwards then set up Adams for his second before Vale hit back with a strike from distance. Striker Adams restored Barca’s two-goal advantage when he secured his hat-trick and his 27th of the season after the break. Edwards soon made it four, but complacency soon crept in as Clermiston scored two more, but they could not engineer another.